Negotiations are still ongoing in relation to the future maintenance of the County Antrim War Memorial at Knockagh. Mid and East Antrim Borough Council has confirmed in a statement that sharing the annual maintenance costs for the scenic site with other councils remains an unresolved issue. It is believed that at least one council has shown reticence about annual maintenance costs for the memorial, which although sited in the local council area, is the official war memorial for all of County Antrim. The local council revealed this week that the annual cost of maintaining the monument is just over £2,000, which is currently totally funded by Mid and East Antrim Borough Council. The memorial was erected in 1925 to mark the fallen of the First World War, with the foundation stone being laid in October 1922 by the Countess of Antrim. The 110-foot obelisk was modelled on the Wellington Memorial in Phoenix Park in Dublin, although half its size, and was created from Antrim granite. At the time all the work was carried out by labourers who were ex-servicemen. Although the monument was expected to be completed in a year, financial difficulties delayed the work for a decade and it was not until 1936 that it was completed. Ironically, another world conflict would ensue within three years, and after the Second World War the memorial was dedicated to the dead of both wars. 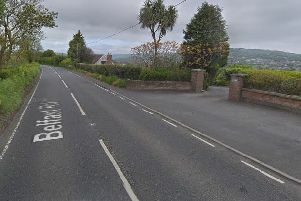 In more recent years there have been refurbishments in 1985 and in 2006, with all the existing 10 councils in County Antrim contributing £1,500 to the total cost of £50,000 at that time. However, it remains unclear whether the councils now based in County Antrim will be involved in annual upkeep costs. The monument is likely to be a focal point in 2018, when the centenary of the end of the First World is commemorated. However there appear to be no current plans for the Knockagh in relation to the centenary. “This is a matter for the Knockagh Joint Committee to discuss and make recommendation to their respective councils,” the council said this week.